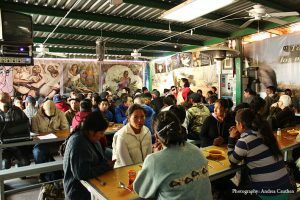 The migrants served at the KBI comedor and women’s shelter share friendship, stories, and a generosity of sprit that unites them. Amidst the suffering endured by migrants who are apprehended, detained, and deported, a deep bond of common experience and common humanity is forged, and many a migrant story includes touching details of kind strangers, helpful advice, and shared resources. Every day, the KBI encounters people who, despite their own pain and untenable circumstances, offer sustenance and solidarity to others. Tere is one of them. Deported to Nogales, Sonora after decades of living in Phoenix, Tere arrived at the KBI comedor and women’s shelter last spring. She’d established a life there amid extended family and her two daughters, ages 11 and 9. A Mexican woman in her thirties, Tere was a committed employee and community activist, volunteering for a number of local organizations and participating in immigrant rights campaigns. The deportation undid all she had worked to achieve, but though devastated, Tere committed herself to figuring out next steps, hoping to find a way for her young girls, both U.S. citizens, to visit her in Nogales. However, a means for legally returning to Phoenix or seeing her children was not readily possible. So Tere decided to re-enter the U.S. from Mexicali in Baja California where she’d heard crossing might be easier. At the border, she was apprehended and sent to a detention center in San Luis, Arizona for two months. The conditions there were, as often reported, poor and inhumane. She was given a stained uniform and used underwear; the food was inedible; medical care was inadequate. But the greatest burden was the inability to be in contact with her loved ones on a regular basis. Deported to Mexicali after completing her 60-day sentence, she discovered a border city very different from Nogales—the population was larger and the work opportunities more advantageous. There, a friend she’d met at the KBI women’s shelter, Karla, joined Tere so they could divide expenses and support each other through such a challenging time, and they rented a small room at a migrant shelter together.